Saint Matthew's Churches is a very old church ministry that was first established in 1951, more than a half of a century ago. 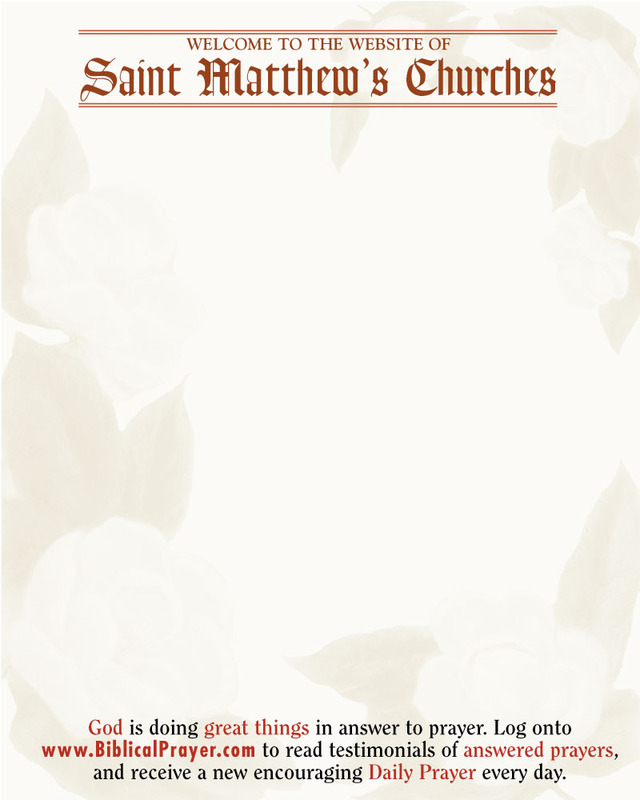 Saint Matthew's Churches is one of the oldest ministries in the United States, established by fifteen born again, saved, redeemed, Christian families, often referred to as the first fifteen founding mothers and fathers of Saint Matthews’s Churches ministries. And, in more than one half of a century, St Matthew's Churches ministry has planted churches, by faith, and for years has conducted mighty church revivals nationwide where thousands accepted Christ as their Lord and Savior, as you will see on this website of Saint Matthew’s Churches. Saint Matthew’s Churches has believing members in all fifty states, who are born again, saved, sanctified, redeemed Christians who are ready for Christ’s second coming. In some states we only have a few hundred members, whereas in other states there are thousands of loyal members. We welcome people of all faiths, races and income levels. Some of the church members of St Matthew’s Churches organization have been with Saint Matthews from five up to fifty years, as they continue in their worship of a living, loving, prayer answering Lord and Savior Jesus Christ. We invite you and your family to worship a living Christ with us, in our churches and through Saint Matthews home missionary ministry by mail (St. Mark 13:10).